Very cute and clean hostel! The owners were really nice and helpfull. They offered breakfast for free every day and coffee, tea and cappuccino were free to take too (all day). The kitchen was nice, with oven, gaz, microwave and all other equipment. Very luxury bathroom and modern rooms. Only thing is there were no lockers in the dorm. Very good location, 10 minutes from the central train station and 4 minutes from the airport. The pisa tower was 30 minutes by foot. 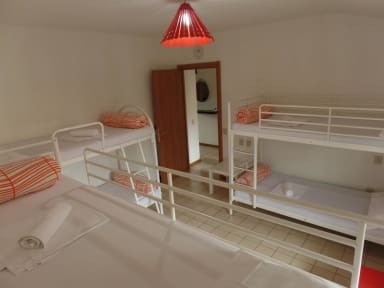 Leuk hostel met aardige en behulpzame eigenaar. Dichtbij het station en het vliegveld en een klein half uurtje lopen van de toren. Ook een leuke ruime kamer met goeie wifi en een fijne badkamer, wel gedeeld met iedereen in het hostel en daar was de wc en de douche, dus dat was soms een beetje onhandig. 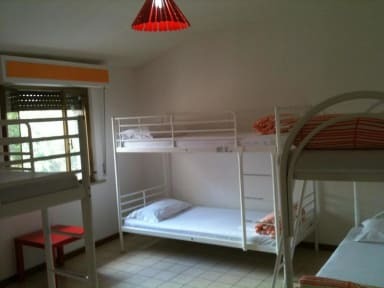 A nice hostel in Pisa, which is close to the leaning tower and the city centre. The Hostel was clean and cosy, and its staff was very friendly and helpful. We enjoyed staying here (although only for one night) and would therefore recommend it! Simpeler hostel maar helemaal prima voor één nacht, keukenspullen waren wel smerig en oud. Dat terwijl er overal regeltjes houden waar je je aan moet houden. Wel is de eigenaar een zeer aardige man terwijl die op eerste moment beetje apart overkwam. Easy Pisa is echt een hostel. Goedkoop en het ligt dicht geniet bij het vliegveld en het treinstation. De eigenaar is een aardige man die wat langer wakker bleef voor ons. Er is een slaapzaal waar 6 bedden in staan. Erg gezellig, maar het was echt te warm. Groot minpunt was het ontbijt: dit was een droog chocoladebroodje met een pakje crackers... voor het inbegrepen ontbijt hoef je het dus niet te doen. Hostelowner was fine, the hostel just lacked atmosphere. Not aloud to sit in the public area after 11 and they kick you out at 10 O'clock. The most terrible thing was the temperature in the room. It was freezing cold. Not a nice experience at all. Besides that the hostel is located far away from the center which is at least 40 minutes by foot. Also you cannot leave your bags at the hostel so you have to leave them at the station for 5 euro per bag. This hostel is just a room in someone’s house. You have to share the bathroom with all the guest+the owner of the house. There is no atmosphere, you’re not allowed to take a shower between 9 am and 2pm. I would not recommend this hostel at all, it’s just very strange to me, to share a room with guys aged 50+ in a small room in a men’s house..